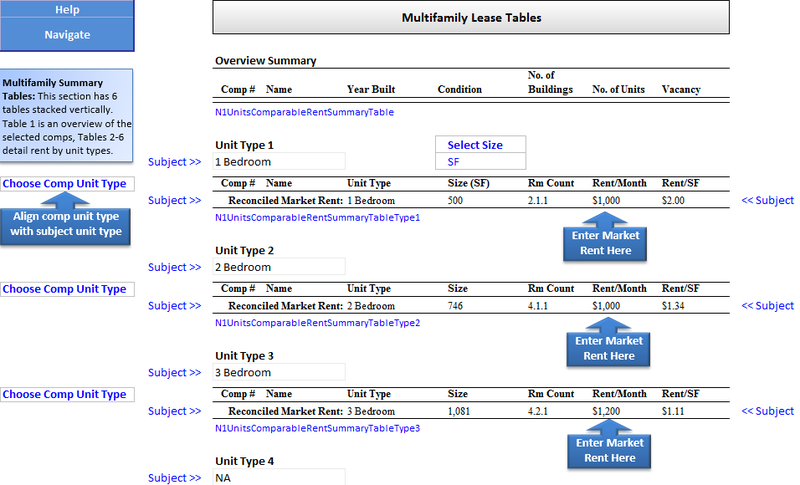 Lease grids are similar to Land and Improved Sales Grids however they include special tables for multifamily rent analysis, located after the Summary Table and before the Comp Sheets. On the drop-down navigation menus, select "Summary Table, Units". Note: Comps must be selected via Arrange Comps. The Lease grid is intended for commercial leases. For Multifamily rent analysis, a Multifamily Units Table is also on this sheet. The top portion of this worksheet is shown below, with differences highlighted. The 'Lease Grid' has the ability to display up to 7 different commercial tenants from the same comparable property. This functionality deprecates the Lessee, Date, Effective Rent, SF Leased, Term, and Terms fields(Common in older Narrative1 builds) in favor of Comm 1 Lessee, Comm 1 Lease Date, Comm1 Rent/SF, Comm 1 SF, Comm 1 Lease Term, and Comm 1 Lease Type in their respective order. For additional tenants, the Comm 2 - Comm 7 fields are now available. If these fields are not available within the 'Comps Database', please fill out a support request and we can activate them for you. 'Format Currency' allows you to change the currency format in the Lease 'Grid'. The Commercial lease table is the same as the Summary Table on the other grids, with the added feature that tenants are listed for each comp. Tenants are entered as part of the comparable record. This tenant list populates the drop-down above each Comp so that the representative tenant can be selected to populate the data in the Lease Grid. There are six multifamily tables. The first table provides a summary for the comparable properties such as Name, Year Built, Condition, No. of Buildings, No. of Units, etc. These categories can be changed by selecting database field name in the drop-down in the header row, similar to other tables in the Narrative1 system. The remaining five tables detail rent information for each unit type. Again, the data displayed in these tables can be changed by selecting different database fields, but this case we have special rows above the table for this purpose. These pages are like the comp detail pages for the Land and Improved Sales Grids except for the additional Leases section. Data for up to seven(7) tenants are shown. The information shown cannot be modified. There are two buttons in the upper right corner which allow review of images and maps. Clicking on the View comp image... button shows a drop-down from which a particular comp can be selected. 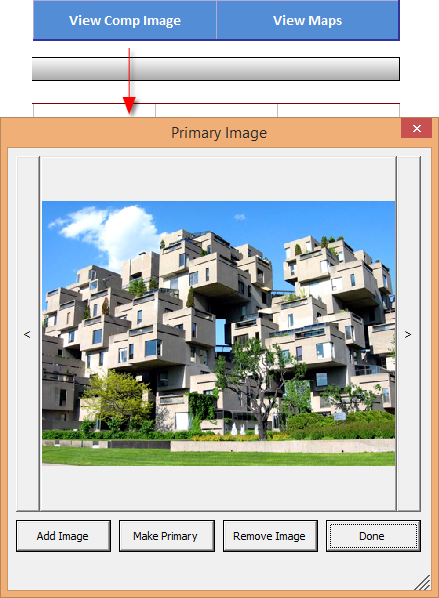 Upon selection, the image manager is shown. The image manager allows new images to be stored, adjustment of the primary image, or removal of the image from the database. Clicking on the Maps: button shows a drop-down of map options: Google Maps, Google Earth, and Merge Map Size. Selecting this option starts the mapping function of Narrative1. 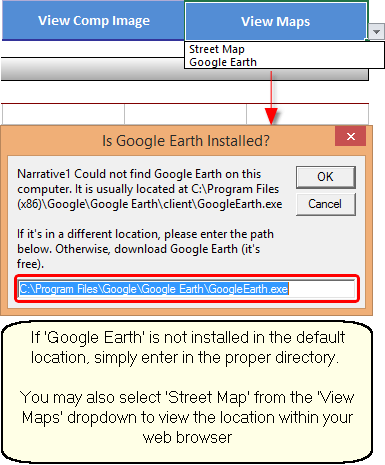 Google Earth is an app that can be downloaded (free) from Google. Selecting from the drop-down will launch the app. If the app can not be found by Narrative1, a message box will notify the user the app is missing or perhaps it was downloaded to another folder. If the latter, an alternate path to the app may be specified.